Exploring the new horizon of new profession is always exciting for any successful individual. Many talented individuals always eager to learn new skills, fields for earning and learning. Good news is that you can be one of that successful individuals. You can be your own boss and you can earn between £1500 – £3000 part time monthly by only giving you dedicated few hours in a week. We have designed a system of learning material, practical demonstration-based sessions and systematic way of exploring field of repairing & fixing smartphone such as iPhone, Galaxy, tablets. 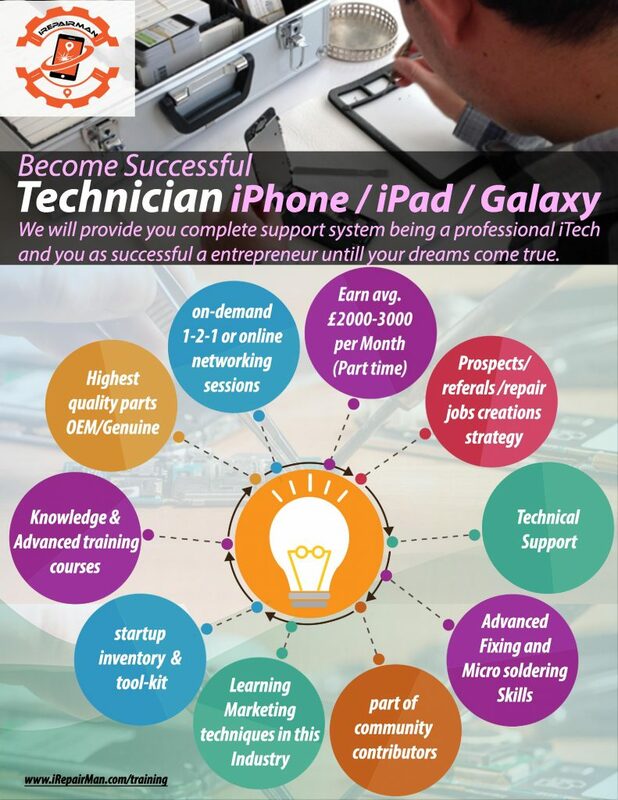 If you believe that you want to be your own boss, you love travel within London, you want to work with your own pace , you love the world of technology and smartphone industry, you are dedicated individual for learning new skills in technology, and more importantly if you want to build your own successful business, if you want to become successful smartphone iPad, Samsung technician then there is a good news that we will provide you complete support system being a professional technology expert and as a successful individual to reshape your professional horizon. 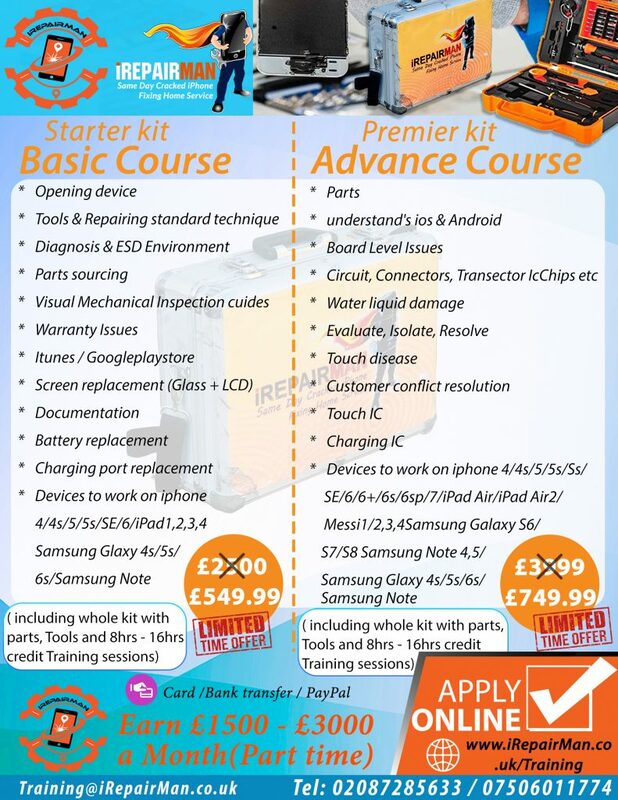 In this training you can choose one of either basic package and advanced package to kick start your new career. Experienced technician and experts, in the field will be conducting the on-site and online sessions. 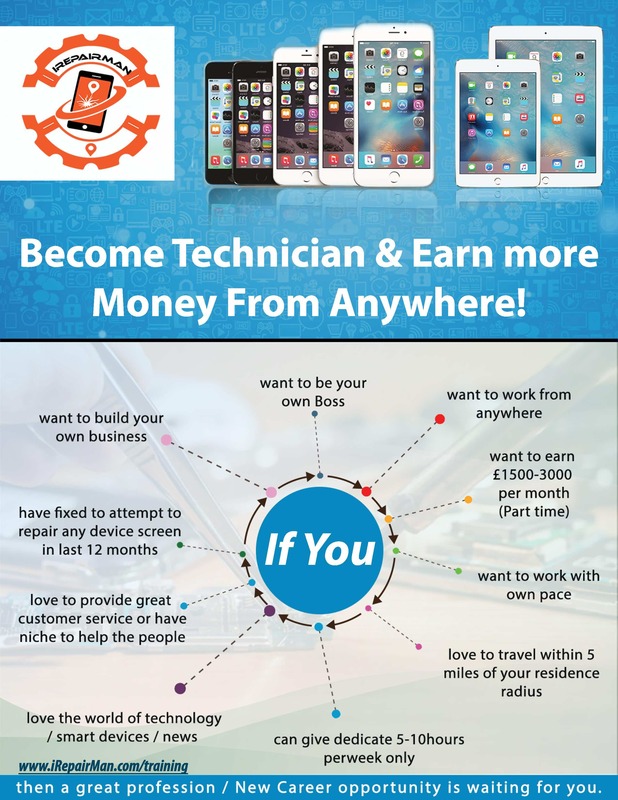 In few weeks and months, you will be able to fix any popular smartphone (such as iPhone any model and Samsung), Tablet, iPad devices. You can help millions of people and organisations in your city and your friend & family in a professional capacity by fixing their smart-devices. More information you can find on the website. Please feel free to contact us on anytime and fill out the web-form if you are really interested to become a professional technician in a friendly environment. We believe this could be game-changer of your life and your career.